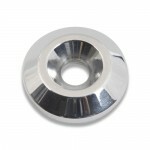 Machined from billet aluminum to accept a flat or tapered head fastener. Dimensions 1/4" x 1-1/4". ..
Machined from billet aluminum to accept a flat or tapered head fastener. Dimensions 5/16" X 1 1/4" ..
Machined from billet aluminum to accept a flat or tapered head fastener. Dimensions 3/8" X 1-1/4". ..